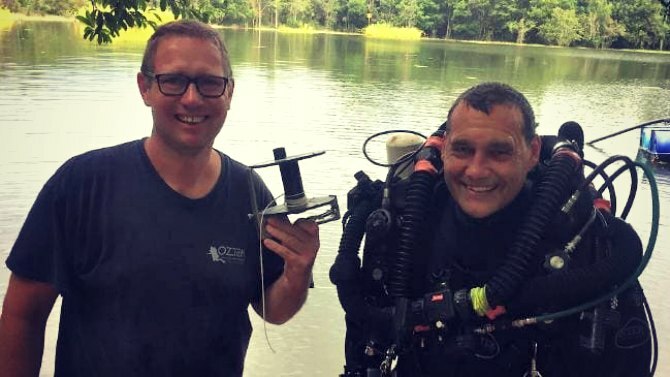 Long-time dive buddies Dr Richard Harris and Craig Challen flew to Thailand to become part of an extraordinary rescue that had the world on the edge of its seat in July 2018. A soccer team of 12 boys, aged 11-16, and their 25-year-old coach had been trapped in the cave for 10 days before they were discovered. Dr Richard Harris and Craig Challen provided medical care to the soccer team inside the cave, and throughout the entire rescue. Working 14-16 hour days they made the trip to the cave daily as part of the three-day international rescue effort to successfully evacuate the boys and their assistant coach. While Dr Harris’ medical expertise as an anaesthetist was invaluable for monitoring the boys and determining their fitness to make the trip, Mr Challen was there for his technical expertise as a cave diver who has set depth records for diving. Conditions for the rescue operation were “as hard as it gets”. Both Richard and Craig have dived all over the world together. Their determination and dedication was impeccable, they only left the site when the last of the boys had been evacuated each day, and they bravely assisted in escorting the last of the boys out of the cave themselves. Dr Richard Harris’ role in the successful operation at Tham Luang Cave had seen him widely praised as a hero. However, Craig Challen’s involvement escaped the public spotlight, and came to surface after the rescue was completed. Former Navy Seal diver Saman Gunan lost his life while installing oxygen tanks in the flooded cave complex, a hero for all concerned. This rescue operation was extremely dangerous requiring courage, discipline and team work to continue on with the operation. The training that rescue divers undergo is extensive and includes a stress test where divers lose their face mask and air supply. It's one of many that no doubt prepared them for the rescue mission. Their experience and mental strength ensured the rescue operation in Thailand was a success. The global cave diving community is small enough that Craig Challen and Dr Richard Harris had previously met on other rescue dives. They do this work because they have a passion for it, they absolutely love it. Australian hero who led the daring rescue of 12 boys trapped in Thailand's Tham Luang cave, braving treacherous conditions to bring them all to safety. Has a professional and voluntary interest in search and rescue operations, establishing the first sump rescue training course in Australasia. One of Australia's leading technical divers, he is a member of the Wet Mules, a diving group that takes on some of the world's deepest caves. Works professionally in anesthesia and aeromedical retrieval medicine. Australian hero who played a pivotal role in the daring rescue of 12 boys trapped in a Thailand cave. He braved treacherous conditions to extract the boys from the flooded Tham Luang cave system. He has explored caves throughout Australia, New Zealand, Malaysia, Indonesia, China, Thailand, Vanuatu and the Cook Islands. A veterinary surgeon by profession, now retired, he is also a helicopter and airplane pilot. If you would like to Learn about Dr Richard Harris and Craig Challen’s keynote presentations, contact us for more information, call 1300 55 64 69.